Aquatic adventurer Charlotte Brynn completed another border crossing swim: a 16.5-mile circumnavigation of Île Ronde in Québec, Canada. 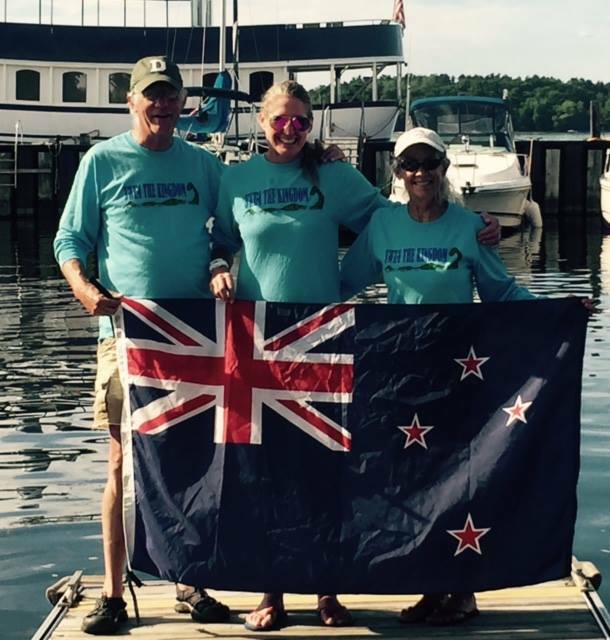 The out-and-back course on Lake Memphremagog that started and finished on the American side of the border in Newport, Vermont took her 7 hours 59 minutes. She swam north across the border into Canada, circumnavigated Île Ronde, then headed south back across the border into U.S. waters and returned to Newport. "We're grinning ear to ear." Photo shows Brynn with Phil White and Cynthia Needham of the Northeast Kingdom Open Water Swim Association. Background of the swim is explained here.